I catered an event recently where the meal was Asian themed – a ginger and lemongrass infused tomato soup (from my cookbook coming later this year! ), soy and brown sugar glazed salmon, mixed greens with a ginger-honey-garlic vinaigrette, cilantro and coconut rice, and ginger-sesame glazed carrots – and I was in need of an Asian inspired dessert to accompany the meal. I found this recipe from Darlene Schmidt on about.com, and knew it would be perfect. 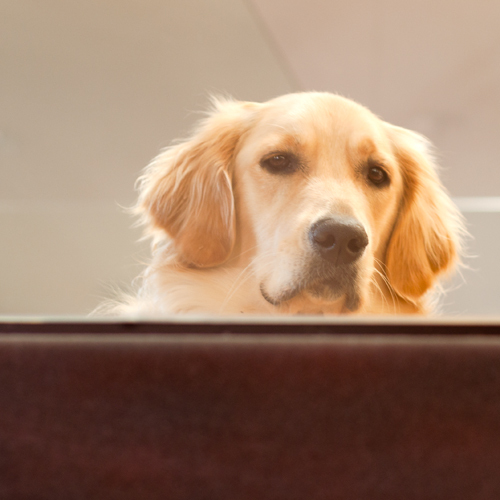 That’s my Ellie, who is now a year old, watching me cook from the landing above our kitchen. Such a sweetheart, but doesn’t she look skeptical about my ability to make a cake? You probably know by now that the vast majority of recipes on this site are my own. And surely you know that I don’t do a lot of desserts on this blog – baking just isn’t my thing. So this is one of those rare times when I’ve only slightly adapted a recipe from someone else to post. Darlene’s recipe calls for mango in the topping as well, which would certainly be a traditional flavor in Thailand, but when I cut into my mango, it was completely black inside. I hate when that happens! So I just made my 100% pineapple instead. You’ll want to cut small pieces of pineapple to fill the holes where the core was on your pineapple and to fill in around the pineapple circles, so that you don’t have any gaps on top of your cake – you can see that in my photos. When you take the cake out of the oven, it will probably look ugly like this. Don’t worry, you’re going to be turning it upside down once it’s completely cooled so that side won’t show. Instead, you’ll have this lovely caramelized pineapple topping that’s just begging to be cut into. The cake itself is a moist and decadent thing, and a little whipped cream would be good with it. Or how about a bit of Ginger Ice Cream? Preheat oven to 350 degrees and grease a 9 inch cake pan with butter. Lay pineapple rings inside the pan, then cut small edges of pineapple to fill in any holes or gaps so that the entire bottom of the pan is covered. Combine brown sugar, water, molasses and butter in a small saucepan and bring to a boil; simmer until butter melts, then pour over pineapple and set aside. Beat egg whites until stiff peaks and set aside. combine egg yolks, sugar, salt, and butter in a mixer and beat on medium until smooth. Add flour, baking powder, coconut milk, and vanilla and mix until well combined. Gently fold in egg whites and then pour thick batter over the top of the pineapple slices. Bake until a toothpick inserted into the center comes out clean, about 40 minute. Cool cake completely before inverting a platter over the cake and turning it out to serve. May be served with whipped cream, caramel sauce, or ice cream. What a great idea. 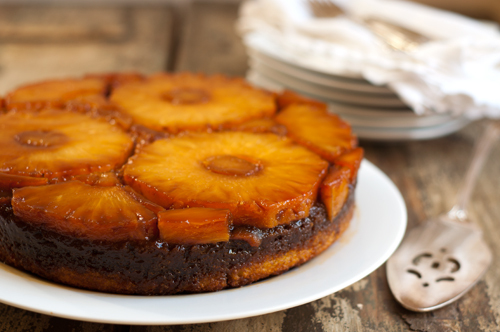 Pineapple upsidedown cake was always my dads favorite desasert. I have a huge box of pears and would like to try this recipe with pears. Pear and ginger get along great together. I have two favorite cakes; German Chocolate and this and I do believe this reins supreme. True confession? That caramelized pineapple? You could even have half the cake part; that’s what I truly love! I loved this Thai style cake. Looks so tempting! 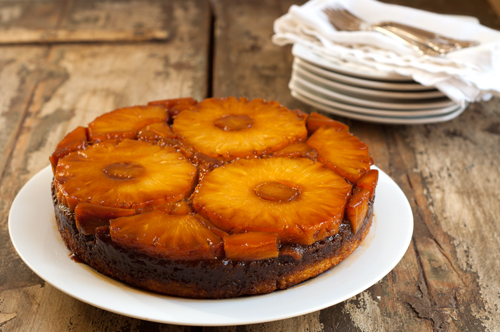 I love pineapple upside-down cake and this would be perfect with an Asian inspired meal. 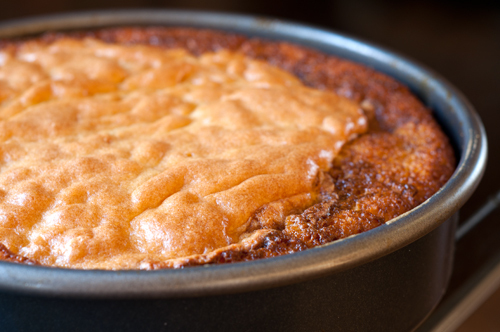 This is a fantastic pineapple upside-down cake recipe! I’ve made this one quite a few times by now and it’s always a hit. I do use honey instead of molasses though since the kids prefer the sweet to the spicey version. The syrup doesn’t harden as well with honey but it’s delicious anyway.